Since their foundation in the early 1980s, Esprit de France hotels' core values have been heritage and art. Time has enhanced the collection at Hôtel La Tamise. The theme of the selected pieces is fabric interwoven with the history of the neighbourhood where fashion took pride of place. 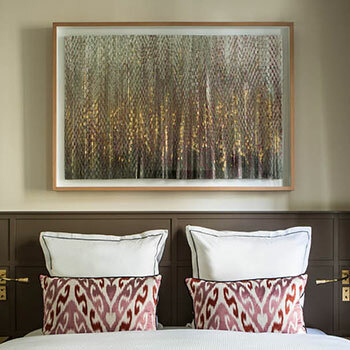 The first piece in the collection is from a pleated series by Belgian artist Isabelle de Borchgrave. The collection has since grown to include several black and white tribal and poetic pieces by Maris Denis. Aside from art, Hôtel La Tamise has paid tribute to craftsmanship in its full 2015 renovation. 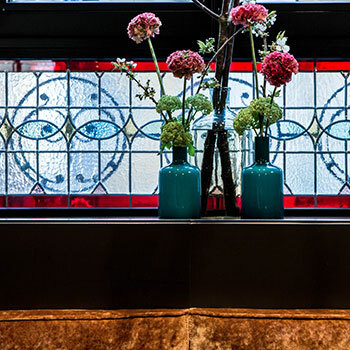 Original stained glass, tiles, Charles X wood marquetry staircase, period mirrors and fireplaces...Countless original features have been kept and renovated by craftsmen with unique and traditional expertise. The original features have been complimented by contemporary designs such as unique handmade mosaics by Mathilde Jonquière in the bathrooms, bespoke lighting, furniture and rugs.